Whether you’re trying to fill out your man cave or you just want a quick and easy way to keep cold drinks nearby, nothing compares to having one of the best beer fridges. These appliances make it super easy to stay refreshed and hydrated, and they can save valuable room in your main refrigerator as well. Today we’re going to be looking at the top models on the market, as well as discuss the various elements that make these beer fridges so desirable. Once you’ve put on in your home, your garage, or your party room, you’ll wonder how you ever lived without one. Avallon ABR151SGRH 86 Can 15"
When picking out the best beer fridges, one of the first things that you’ll have to decide is whether you want the front to be glass or not. 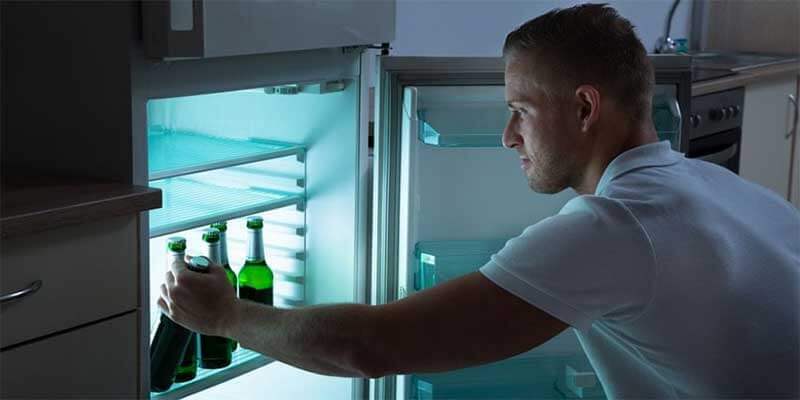 For some people, being able to see what’s inside can be helpful, while others may not like the fact that the glass can affect the fridge’s ability to stay cold. In this case, we have a glass-door model, which is what most of the ones we’re going to be looking on this list are. Glass is standard because many of these fridges are built to work for both home and commercial use. If you have one of these in your business, you want customers to be able to see what’s inside so that they can choose beforehand. This case is built to hold up to 120 cans so that you won’t run out anytime soon. However, remember that that number is based on standard can sizes, so if you want to store other beverages in your fridge (i.e., bottles of beer or wine), then you’ll have to plan accordingly. Fortunately, the three shelves included with this unit are adjustable, so you can make them as narrow or as wide as you like. This way, you can store all of your bottles or larger cans standing up, rather than having to put them on their side. You can fit more in this way, ensuring that you get maximum storage space with this fridge. If you live with children in the house, then don’t worry about keeping beer and other spirits within arm’s reach. This particular model comes with a locking mechanism on the door so that you can ensure that your little ones don’t accidentally grab something that they’re not supposed to. Also, you can keep guests from breaking into your stash if you prefer as well. Overall, when it comes to the best beer fridges, this model from Danby is relatively standard. It has a decent temperature range (43-57 degrees), and it’s made of solid materials, such as stainless steel. You’ll appreciate having it in your home, as long as you’re not looking for almost-frozen beverages. When it comes to items designed to keep things cold, such as coolers, thermoses, and refrigerators, Igloo is one of the most recognized brands out there. Compared to other companies, you know what to expect when you buy something from Igloo, which can offer some peace of mind in your search for the best beer fridge. In this case, we’re looking at a standard mini refrigerator, meaning that it’s not explicitly designed to hold as many cans as possible. However, that being said, you may appreciate the versatility offered by this model, especially if you want to store other things besides cans (i.e., bottles, food, etc.). What’s nice about this fridge, in particular, is that it comes in a wide variety of styles. All too often, these devices are either black or white, so it’s nice that you have some options concerning color and appearance. This way, you can be sure that it will fit in with your decor, especially if you’re putting it somewhere festive, like a billiards room. Another thing that you may not know about mini fridges like this one is that you can switch the door around if necessary. Thus, if you’re tired of having to open it on the right side because you’re left-handed, then you can pop it off the hinges, flip it around, and you’re ready to go. Most beer fridges have this capability, so be sure to double check if that’s something important to you. With regards to storage, this model has 3.2 cubic feet of space. However, there is a mini freezer in there as well, so be aware that you won’t be able to fit as many beverages in this unit as you would with others. Still, the slide-out shelves are adjustable, meaning that you can keep a lot of different items in this fridge. Also, there is a can dispenser in the door for your convenience. Overall, if you want a mini fridge with versatility and personality, then this model from Igloo is going to be an excellent choice. It’s energy-efficient to help you save on your electric bill, and the thermostat is adjustable so you can keep your drinks at the right temperature all the time. When trying to keep your drinks ready for consumption, some people like to have them almost at freezing. Colder is better, and they prefer to have their beer or soda a little frosty around the edges. Unfortunately, though, many mini fridges don’t have a powerful enough compressor to get the job done. This model from NewAir, on the other hand, can get your drinks down to a chilly 34 degrees, making it one of the better options out there. That being said, though, keep in mind that when you have the fridge at full capacity, it will affect the unit’s ability to hold that temperature. Unfortunately, that’s a fact for all mini fridges, so be sure to remember that when making your decision. Nonetheless, this beer refrigerator is an excellent choice if you want to hold a lot of cans. It can carry up to 126 cans, making it one of the higher capacity models out there. Best of all, it has five adjustable shelves, so it’s not hard at all to customize your storage to fit any container you prefer, whether it’s bottles of beer or two-liters of soda. One other feature that we like about this fridge is that it’s super quiet. At just 35 decibels, you may wonder if it’s even working since you can’t really hear the compressor. Also, it’s relatively compact size enables you to put it almost anywhere, whether it’s in the living room or the garage. One thing to keep in mind, though, is that this is a rear-venting unit. As such, the manufacturer recommends keeping the area above it clear to ensure that it works properly. If you put it underneath a counter, for example, it may overwork the compressor and lead to warmer temperatures inside. Over time, the wear and tear may cause the motor to burn out prematurely. Like Igloo, Whynter is another well-known brand that makes high-quality appliances designed to help keep things cool. While you may be familiar with their air conditioners and fans, the company also makes this high-performance beer fridge as well. As with most beer refrigerators, this one comes with a glass-door case. However, one thing that sets it apart is that the front handle is not recessed into the side. While we like the appearance of that type of grip, it can be a little hard to grab at times. Thus, if you want an easier method, you may prefer this towel-bar version instead. One thing that we like about this beer fridge is the fact that you can keep the lighting on or off. With other models, the light only turns on when you open the door, just like a standard full-size fridge. However, because the door is glass, it’s nice to be able to see everything clearly before opening it, so we like that you have the option of keeping the light on all the time. When looking at the temperature range of this refrigerator, it’s a little better than most. According to the manufacturer, the range is between the high 30s and the mid-60s, but most people report that it can get down to about freezing. In fact, at the coldest setting, your beverages in the back may get a layer of ice around them. Thus, if you like extra cold beers and sodas, this is your fridge. Storage is also a breeze, thanks to the five removable shelves inside. Whether you want to hold cans, bottles, or something else in there, you can make it fit relatively easily. The shelves are also made of metal so that they will hold up over time. Although this beverage cooler from Phiestina is not as large as other models we’ve seen, you may appreciate the narrower design. This allows you to place it almost wherever you like, thanks to the fact that it won’t be too bulky or heavy compared to other fridges. The other thing that we like about this unit is that it’s super quiet. While other models may be relatively loud when compressing and cooling the air inside, you’ll wonder if this fridge is plugged in and working because it won’t sound like it. Best of all, it’s an energy-saving model, so your utility bills won’t go up either. Overall, this is a simple and effective beverage cooler. We like the blue LED interior lights, as well as the digital thermostat controls. It has a temperature range of 38-50 degree so you can be sure to keep your drinks cold at all times. One thing about most mini fridges (and full-size models as well) is that you have to make sure that there is space around them for ventilation. Because the compressor is stationed in the back, you have to allow for air to flow. This means that you have to keep your mini fridge in an open area at all times. But what if you want to install your fridge under the counter? What if you have a home bar? In that case, you’ll want something like this model from EdgeStar. What makes this better than other units is that the ventilation comes out the front, meaning that you can enclose it on all sides without risk of damage or wear and tear. What we also like about this mini fridge is that it comes with a locking mechanism on the door. Thus, if you do install it behind the bar, you don’t have to worry about prying fingers getting into your secret stash. Other features we appreciate about this model include the digital control panel, the slide-out shelves, and the tinted glass. Overall, it’s the perfect addition to any game room or home entertainment area. You can watch the video. This video created by our friend Compact Appliance. Unlike other fridges that we’ve seen on this list, the Refrigerator from hOmeLabs is built for both beer and wine. Best of all, you don’t have to adjust the shelving to hold both beverages inside, making it both versatile and reliable. One issue with most beverage coolers for holding wine is that they don’t have the right humidity level. That means that over time, your wine will be impacted by the ambient air, which could make it taste a lot worse. Fortunately, this fridge ensures that the humidity is just right so that you can enjoy your bottles at any time. Another feature that we appreciate about this fridge is the fact that it comes with automatic defrosting. With other units, a layer of ice can develop on the side, particularly if you like to keep them cold all the time. This one won’t have that issue, ensuring that your drinks don’t get frozen in place. If you’re a music enthusiast, then you’ll love this next model from Marshall. This fridge is designed to look exactly like a Marshall amp, meaning that it comes with authentic dials and buttons on the front. Your guests will assume that you have an amp, and then be wowed when you open it up and serve them a frosty cold beverage instead. Although the appearance of this unit is the primary selling point, it works well as a fridge. It's size capacity isn’t as much as other models we’ve seen, but it can hold up to 65 cans and four bottles of wine at once, so you shouldn’t have to refill it that often regardless. The temperature range of this fridge is also excellent, giving you the option of cooling your drinks between 34-48 degrees. Since the maximum temperature is lower than 50, you never have to worry about having warm beverages. Also, the thermostat is a dial, so adjusting it is super easy too. As we’ve already discussed, most mini fridges won’t work in a situation where they have to be installed underneath a countertop. Because you have to maintain proper ventilation, you’re stuck putting them out in the open. Fortunately, if you want a fridge that can be flush behind your bar or installed into your kitchen. You can use this model from Avallon. Not only does it have front vents, but it comes with a few neat features that make it a viable option for anyone. One feature we appreciate is the locking mechanism on the front. You can keep any beverages inside without worrying about anyone stealing them when you’re not around. Another feature is the fact that this fridge has four interior LED lights, making it easier to see what you’re grabbing. Also, you can choose between blue or beige lighting, depending on your preference. Our final model is another standard mini fridge. By that, we mean that it can hold a variety of goods, not just beverages. Also, the front is opaque, so you can’t see what’s inside until you open the door. Nonetheless, it has all of the standard features you would expect. This fridge has 3.2 cubic feet of space and no freezer, enabling you to put a lot of drinks (and other items) inside. There are storage compartments on the door as well for added versatility. This model is energy efficient and has an automatic defroster to ensure that ice doesn’t collect on the sides. If you want to store as many cans of beer or soda as possible, then you’ll want to get the NewAir Refrigerator. With 3.4 cubic feet of space and the ability to store up to 126 cans, you can’t get any better than that. You’ll be hydrated and refreshed for days and weeks with that fridge before you have to restock anything. Also, the powerful compressor ensures that all of your drinks are as cold as you like them. For those who want something smaller and more versatile, we recommend the Avallon Refrigerator. We like that the ventilation is in the front so that you can install it underneath a counter for a more seamless operation. While it doesn’t hold as much, it comes with more internal lights for better visibility, and we appreciate the locking mechanism on the front.